An artist impression of the 72 virgins. The Qur’an, hadith and Islamic scholars all mention that virgins will be awarded to Muslim men in Paradise. This article discusses what the Qur’an, hadith and Islamic scholars say about the 72 virgins, and dispels popular misconceptions surrounding them. JERUSALEM – Hamas TV recently aired a broadcast of a Gazan Sharia judge urging Palestinians to take up jihad and renounce their attachment to this world, promising them that martyrdom will come with full absolution and marriage to 72 virgins. He praised Palestinian youth for renouncing life in this world and hastening to become martyrs. “This is one of the secrets behind the fact that the Palestinian people have emerged victorious in all battles. 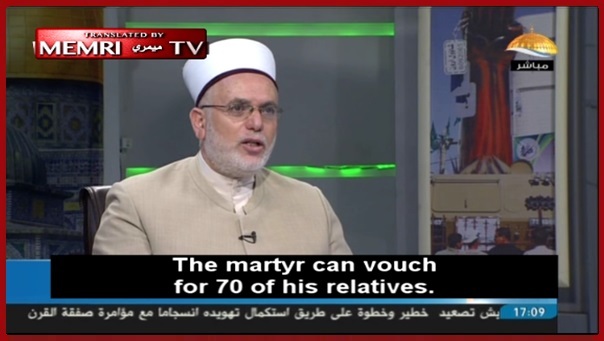 You can see that when the rockets are raining down, our young people march toward martyrdom,” he said last month in a sermon translated this week by the Middle East Media Research Institute (MEMRI). He mocked Israelis, including the IDF, police and civil defense, for having “panic attacks” when they hear sirens — apparently referring to the code red sirens alerting residents to incoming rockets — or when they encounter attack balloons. “The martyr gets six rewards. First, he is absolved with the first drop of his blood. The moment the martyr’s blood is shed, all his sins are absolved by Allah,” Nofal added. Nofal described the martyr as a “unique and special person” who is separate from the rest of the nation. “In addition, he is crowned with the crown of honor. The beads, or the links, in the crown of honor, are better than the whole world and all that is in it,” Nofal said. Nofal further ranks the levels of martyrdom, saying that the highest level is when a person is killed while fighting for the sake of Allah and not when he is in retreat. “Regarding the situation in Palestine I say that Jihad is an individual duty incumbent upon the entire nation. Nobody is allowed to forsake this Jihad,” Nofal concluded. I’ve never understood what use 72 virgins could possibly be to an Islamic martyr, one who has died killing unbelievers, and carrying out Jihad. Am I getting this right? The martyr is doomed to spend Eternity surrounded by beautiful, untouched maidens – but he can’t do anything with them, because his physical body is rotting under the ground somewhere? But then, I suppose none of this will matter, because the 72 virgins will all be spirits too. So everyone just sits around, looking at each other. For ever! Surely this all sounds more like Hell, than Paradise. And what about women martyrs for Islam? Do they get any male virgins? Nope, I give up. It’s all too confusing for this simple kaffur. They are too stupid to realize that Moe was shittin them. Open the Hilali/Khan Noble Koran to 2.25 and read the verse, including the comment.l Purified mates: no excrement!!! What happens when they get full?! The shaheed is 90′ tall and has a permanent woodie: no Viagra needed. Here comes Pistol Pete, 100# of swing meat. I did not find a number in Bukhari. Why doesn’t he go to the border fence/wall and throw bombs himself? I think we know the answer to that. I bet that those ‘virgins’ don’t have vaginas, poop holes, And I bet they are always talking. Non-stop talking. That’s what murderers deserve.